These Sweet 700 Series Sportsman power steering boxes have new quick ratio gear sets in them which significantly speeds up the steering. This steering box features new inner working components with a re-manufactured housing. Fits most 1964-1988 GM passenger cars. -6 AN hose fittings. 13/16" 36-spline input. 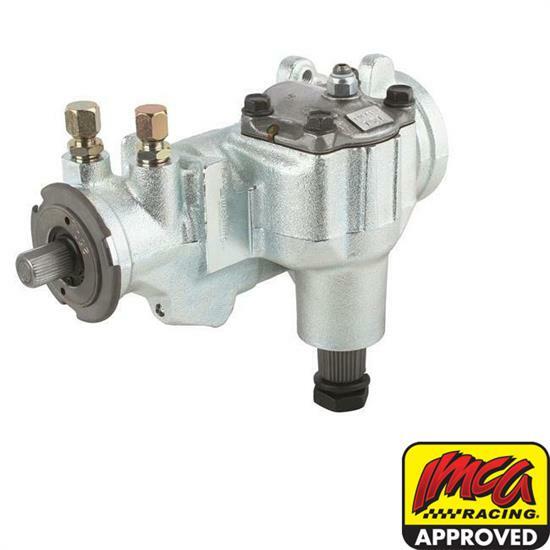 When using a steering quickener, we recommend using a .185 valve steering box. Anything higher will be extremely hard to steer! Autocross/Rally: While not for the average street car, these boxes work great in SCCA race cars or serious Pro Touring cars. Dirt Oval Track: 2009 IMCA approved for Modifieds and Northern Sport Mods. Tim shows you how to adjust our Speedway Vega Steering box. Tim talks about power & manual steering vega boxes. We get a lot of questions about steering parts. Steve talks about some of the steering basics. Today we are installing original style pump, pulleys, brackets, and hoses! Watch as Joe and Zach improve the ratio and make driving the Chevelle easier. Learn some of the main differences between Cross and Traditional Steering. Whether you need a corvair or vega steering box and what will suit your application the best. Steve takes us along as he centers the 525 manual steering gear he is using for his Laguna. In this Tech Tip, John shares some tips with a customer about adjusting a steering box he got from us recently.